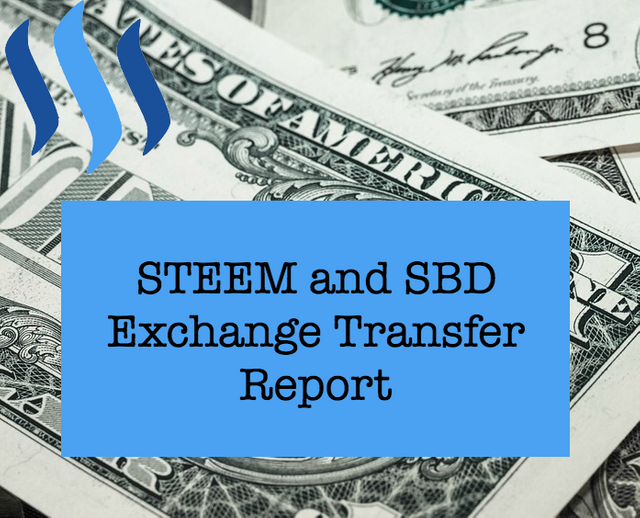 Exchange Transfer Report: 3/5/2017 to 3/11/2017steemCreated with Sketch. The 30th Week of This Report! 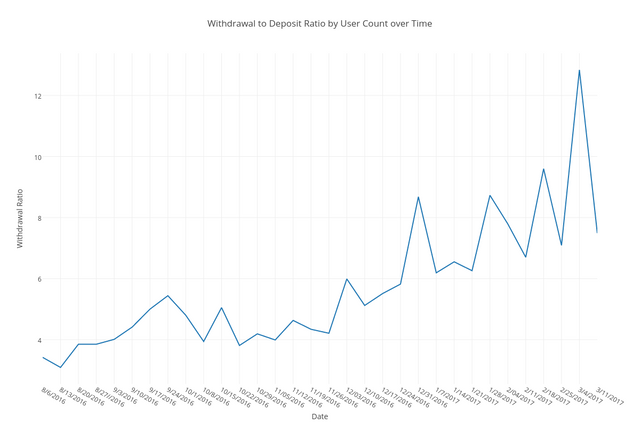 The withdrawal ratio of 7.49 to 1 is way better than last week's high of 12.84 to 1. What will this ratio have to be for the price to rise? What would happen if this number went negative? It seems @inv feels the time to buy is now. 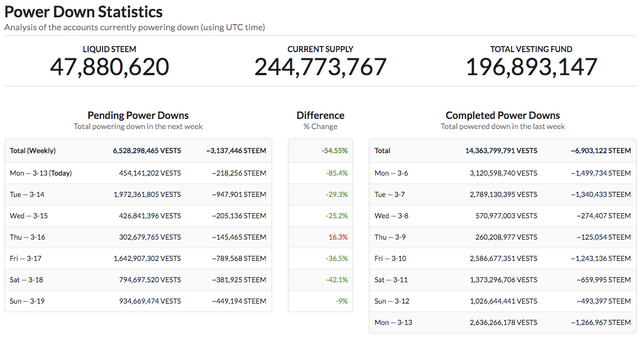 They obtained over 450k STEEM in the last 7 days according to their transfer page. Impressive. Part of me would like to buy some myself. What's up with @c75c39f25a90, @c91c2dfbf2f5, @a6ab6923e0a5, and @b943863a19cf? They all received significant amounts from the @steemit2 account with one having an interesting contractor - for invoice 1 of work order 2 note on the transfer (the others are blank). Maybe this is a way for @steemit2 to move money around without being noticed? Transfers are from 3 months ago, 2 months ago, last month, 19 days ago... interesting stuff. The big question: How low will it go? What's a good buy point and if people do start buying, will whales who've transferred to exchanges but maybe haven't sold dump even more? What will create demand for this amazing technology? Is the technology itself enough or is something else required? If so, what is it? The powerdown amounts for next week is another 50% in the green, as last week was. I think now is the right time to go long on STEEM, as the recent power-down rush is soon over, and the ratio will quickly go close to 1:1. Most people aren't anticipating the event, but once they do, the tide will change! I hope you're right. Seeing a 1:1 ratio would be amazing. As you can see from the graph, I've only ever seen it get worse over time. Unfortunately it seems those who got their money out early are the winners. I just feel like a sucker by always powering up and being overly optimistic. What's up with @c75c39f25a90, @c91c2dfbf2f5, @a6ab6923e0a5, and @b943863a19cf? They all received significant amounts from the @steemit2 account with one having an interesting contractor - for invoice 1 of work order 2 note on the transfer (the others are blank). 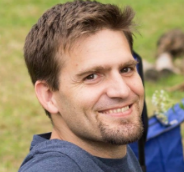 The most obvious explanation is Steemit hired a contractor for some work and paid said contractor with the transfers. What am I missing? The one peice of evidence we have for that claim seems to support it, but I find it interesting because it's the first example I've seen of deliberately obfuscated account names. They actually look more like bitcoin addresses than accounts on a social media site. I find that quite interesting. Also interesting that they are all cashing out on the same week which might imply they are all the same contractor which raises the question of why separate addresses? [nested reply] @lukestokes Good points. I agree it is an interesting observation and practice. Thank you for taking the time to share this. Resteemed upvoted and followed. You're welcome and thanks so much for the follow. Always greatly appreciated. Downvoted to counteract @freedom's upvoting and also some bot-voting. Good luck on your experiment, @abit. I'm glad you and the whales are willing to try things out in these early days, even if you get flak from people about it. I hope it's a useful experiment and brings in long-term benefits for everyone.